What could be more fun than flying off in a space rocket, or exploring fishy ocean depths? 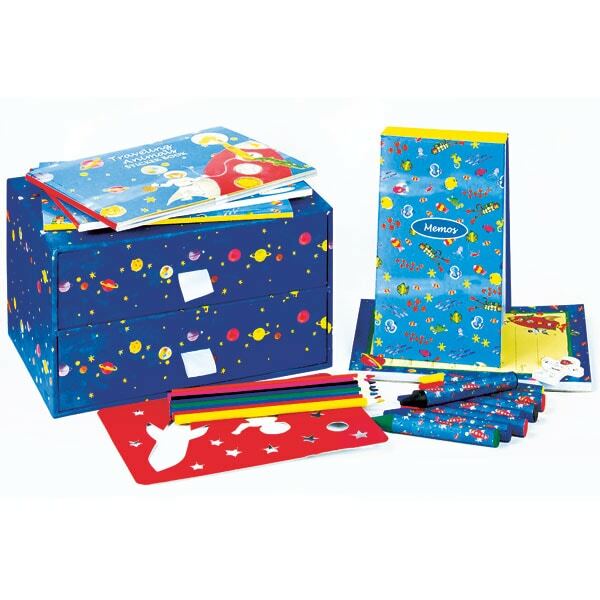 Why, taking your favorite animal friends along, of course, which is the whole idea behind this planet-bedecked blue and red activity chest for readers 6 to&apos;, full of books decorated with Milly Green's whimsical animals and their vehicles. From a zebra in a submarine to a lion on ice skates, from a hippo on a jet-ski to a cheetah on a bicycle, from a monkey in a fire truck to double-decker busloads of assorted creatures, vehicles and animals are all over the place in this set, including a coloring book, a sticker book (with four pages of stickers), and a colorful activity book full of games, puzzles, and even more drawing and coloring fun. They're packed in an attractive two-drawer chest of sturdy laminated cardboard that appeals to the same spot in our hearts that gets excited about new school supplies. Here too you'll find a four-piece set of laminated stencils, a Weekly Planner pad, and a deluxe hardcover desk memo pad, as well as a set of eight colored pencils, eight jumbo crayons, and a shaped white eraser, all decorated with Green's delightful drawings.